Ok I always have the impression I am buying beads constantly and that I am never making something. So I counted how often I posted something here. 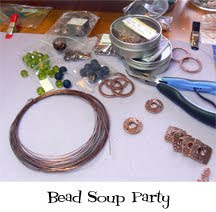 5 purchases, 14 posts about jewelry made. Not bad. I want to keep the first number lower than the second, so I guess I can keep buying? Or should I say posting about what I bought and not keep them secret anymore (since I am buying beads permanently)? 0 Response to "5 : 14"